The kitchen is a room in everyone’s home that people tend to spend a lot of time in. It’s important to keep a room like this up-to-date and liven it up a little. Nobody wants to walk into their kitchen and see the same boring white walls every day, so we have come up with a list to help add some pizzazz to this important part of your household. Add a bold backsplash. If there is little or no color in your kitchen then adding a bold color or print to your backsplash is a great start. There is really no color that can be used that will be a bad decision. Go wild with orange, blue, green, you name it. Adding a fun pattern is another great alternative. Update your hardware. There’s no need to keep those small brass knobs from the 90’s on your cabinets anymore. This is a very easy switch that can make a big difference! Change the lighting. Adding under-cabinet lighting or buying a new chandelier can be a great way to literally bring new light to your kitchen. I know someone who had a flying pig chandelier in her kitchen merely for a talking piece (and look… here I am talking about it), meaning it’s a great way to add some personality to your home. Get new countertops. You use them every time you’re in the kitchen and they take up a large visual portion of the room. 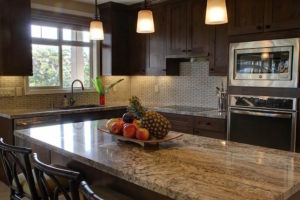 Getting new countertops will transform your kitchen in a huge way! There are so many options to choose from, so you’re bound to find something that will make you fall in love with your kitchen once it’s installed. If you make even one of these changes you will notice a big difference in your kitchen design. If you’re looking to really change things up then go ahead and do all 5! It’s a room that is definitely worth the investment and can increase the value of your home overall. If you don’t know where to begin, you can contact us and our kitchen design division can help you get started.